My problem does not exactly revolve around my CD being lost, but please read on to get the entire picture. Thanks. Ill start at the beginning, I need some help with a issue i'm having with my Roxio HD Game Capture Pro Software. More specifically, Video Wave. I've edited multiple projects and poured a lot of hard work into them(Productions). When i was ready to Export them to my files, from which i was planning to upload to YouTube. I keep receiving a error message during the Rendering process, not allowing the video to be rendered. I referenced this forum post for some help as this user was experiencing the same problem. http://forums.support.roxio.com/topic/88306-roxio-video-wave-wont-render/ . Its important i note that i am running this software on a Windows 8 Laptop that has No CD Drive. I have the CD, i just cant place the software in that format onto my laptop. The way i got the software onto my laptop was by simply downloading the Update which i found here, http://www.roxio.com/enu/support/gamecapture-hd-pro/software_updates.html . Coming back to the first link which i referenced for help, the Digital Guru suggest inserting the disk, which i replaced by reinstalling/downloading the update software instead. I have a feeling that its because of this, that i cannot fix my issue. Which is why i need help with getting the official software that comes from the CD Itself instead of using the updatepack which I'm sure is wrong. Or am i possibly missing a step. To be clear, I DO have the physical contents of the box(Roxio HD Pro Capture, USB Cord, and the CD), i DONT have the retail package, the CD Activation Code, or even the manual anymore. I'm simply trying to get a some sort of download, that has the CD Software, to be able to Repair my software and fix my issue of not being able to Render my videos. I did order the Game Capture from Amazon, so i have a digital receipt(Email and Amazon Order) to use as proof. Which i am unclear if i should post to the thread now, or wait for possible further instructions. Thank you, hope to hear from someone soon. Since you have the DVD containing the program, I would suggest going to a friends house and copy the contents from the DVD to a USB drive and use that for install or repairs. Why did you title your topic as "Lost CD for HD Pro" if you have the disc? What is the exact error message you are getting? I want to start off by thanking you, Digital Guru for replying so quickly. Ill go ahead and try that right away. Sadly, i am going to need some help to correctly and successfully copy the data over from the CD to the USB, as well as what i should do once i have the data on the USB and I'm ready to Repair my software on my laptop. If there is a possible reference you recommend, or if you could possibly list the steps. I understand that the title of my topic may have been incorrect or misleading which is why i tried to explain the situation at hand, as clearly as i could to avoid any confusion. 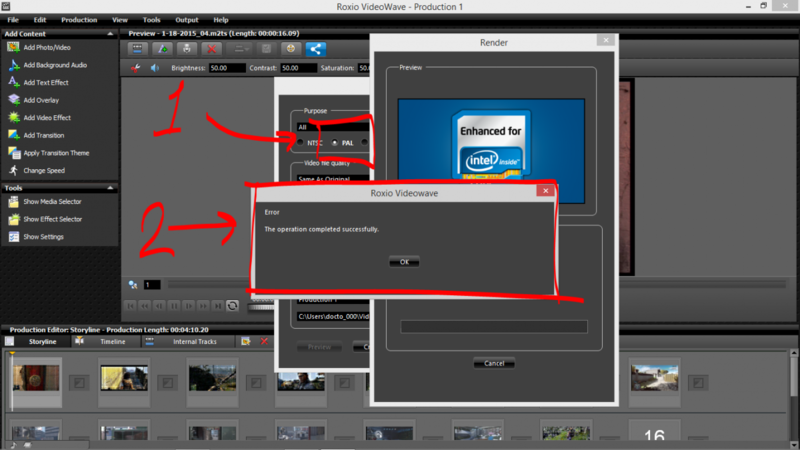 To be specific of what my situation is, whenever i try to render my videos by selecting the Export As button. 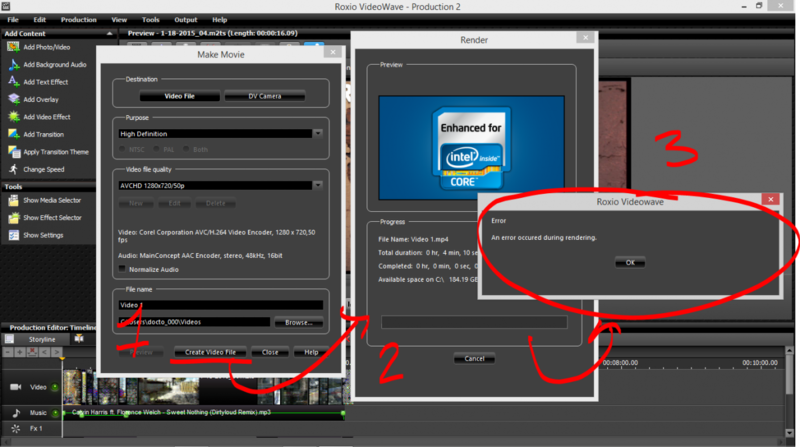 I choose the settings i want the video render at, and as soon as the Render screen opens, no progress happens. Not even in the progress bar. After a couple seconds of it staying in a blank state, the preview screen changes, and i get a new small window saying a error has occurred. Here is a screenshot. This is the process i have done to copy the data from the CD to the USB. I opened the CD files by clicking on Computer from the start menu. Same for the USB itself. And simply dragged all the files from the CD to the USB. Ill now be plugging the USB into my Laptop, and starting the "Setup" file. Once its finished completing the setup, ill be sure to report back what the results were. I followed the steps recommended, http://forums.support.roxio.com/topic/88306-roxio-video-wave-wont-render/ . Sadly, the problem/error is still occurring. The only thing different this time, is that i changed the "Purpose" to all, "Video Quality File" to Same as original. Those are the only things different from before the repair, and now the message in the error window has changed from, "An error occurred during rendering", to "the operation completed successfully". But the video is nowhere. Can you post the same image as above but this time for when it succeeded? What i meant by "the video is nowhere" is that the video does not show up anywhere. Not even in the specified save location next to my Label 1, which is just my Videos folder. I forgot to mention this in the earlier post. The new message that claims to have been successful only happens when i choose PAL(Label 1). This is the new error message i get(Label 2). Why don't you load a Windows Sample file (WMP) that comes with every OS into VideoWave and render it. I don't have the sample files on my laptop anymore. The only video's i have are the ".m2ts" videos i have captured with the Roxio itself. Is there any possible way to transfer the video's/productions i have captured to a USB to try rendering them on my friends computer? Every time i try to copy the capture/production files onto a USB. I receive a message that not all of the files properties can be copied over. So i have not tried it, would you recommend it? You can ignore the "file properties" message when copying to a thumb drive. That's just some extra "meta data" that NTFS formatted drives support, which the FAT file system on thumb drives don't support. It's not required data so just say, "yes" and let it continue to copy the files.